It might be thanks to the spring, sun and the warm weather, but for quite a while now I have been feeling really inspired, happy and excited. I am too superstitious to say too much, but lets just say life has been good lately. I have been inspired by many amazing blogs, I have been so excited to try new recipes and experiment with new ingredients, and it's these little things that make me so happy. It is so easy to get stuck in the same routines day after day. Cooking has become something that really breaks up my routines almost daily. Yes I cook every day, but most of the time I'm trying out a new recipe, and when I'm using ingredients I haven't cooked with before, it's even more exciting. This is such an important part of my daily life. It's what creates the balance between work and the life outside work. I also like to do my exercise every day after work to clear my mind and get ready for some kitchen therapy. I have always been an active kind of a person, I can't sit still for too long, I like to 'get things done'. This salad is inspirational to me because it is so full of flavour. When I was making this, I kept testing it, adjusting the spices, tasting some more, adjusting the vinegar, and so on. It was like painting a picture where you add layers of colours, shades and lights. This is exactly what I love! Rinse the lentils and place in a saucepan with the water. Bring to boil and let simmer for about 15 minutes or until just tender. Drain and rinse under cold water (and drain again). Place in a large bowl. In a bowl, mix all vinaigrette ingredients together and whisk well to combine. 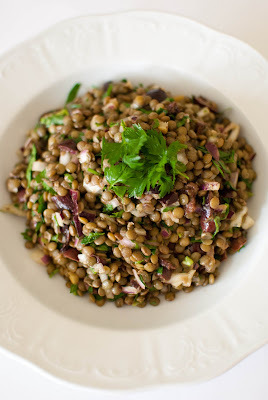 Mix the onions, preserved lemon, olives and parsley with the lentils, then spoon over the vinaigrette. Stir everything together and place in the fridge for at least 30 minutes. 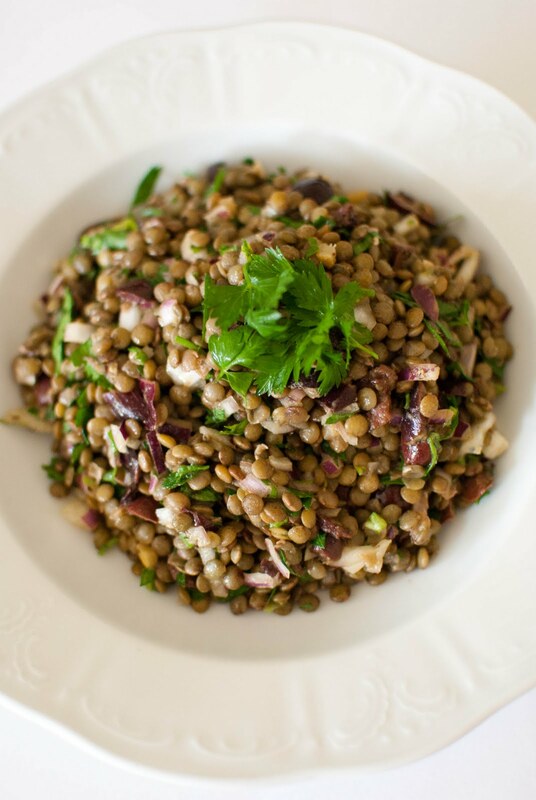 Serve with baby spinach, rocket or other leafy greens. Maria I just love the flavors you have added to this. Lentil salads are wonderfully versatile. I made one a while back with very different flavors. 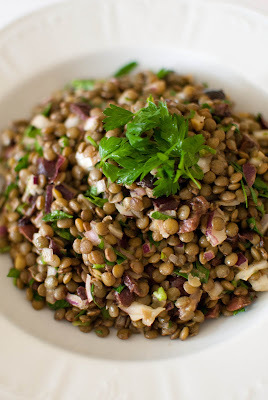 I made craptonnes of lentil salad when I worked in a deli years ago but haven't done it since (I guess I had enough for a couple of years) but I think I might be ready! Lentils are awesome, and I think I have some ACV. Looks so nice! Love following your blog. Made some credits for you on mine. Hope you do not mind. Nice that you wrote comment to our blog - that way I found your beautiful pictures and yammy looking blog! I saw that in your pictures there is a photo of Niki Segnits "the flavour thesaurus". Have you found it useful? I have also thought about buying it. Malin, thank you for your post, I loved it! What a delicious salad! The spices in the vinaigrette bring so much flavor! What a great healthy blog you have! Eat Pray Love was a great movie I haven't seen for a very long long time. It is a food for thought. Everyone has something that hold ourselves back from doing something. Sometime we think we are the only one who have a personal issue but the truth is that everyone does have their own issues to resolve. I adore Liz that she is open with her issues and generous to comfortably share it. Matcha Spelt Crepes with "Edamole"
Rene, Jazz, Organic Food and Much More!